Our 2012 Alicante Bouschet is a prime candidate to pair with your autumn grilling. Its peppery, meaty profile is balanced by dark red fruit notes, and accentuated by ample tannins. In fact, it was the incredibly dark color and substantial tannins of this varietal that brought it to California in the first place. Alicante Bouschet was bred in late 1800’s France as a teinturier (tinting) grape, and is one of the few grapes with red flesh (most grapes have color only in the skins). In the old “mixed black” Zinfandel vineyards it was common to have few vines of Alicante to add complexity and color to the vintage. During Prohibition it was widely planted to supply the (legal) home-winemaking endeavors of thirsty Midwest and East Coast residents. During those years, thousands of rail-cars of Alicante and Petite Sirah were sent east. Those two varietals were particularly in demand because of their thick skins, which helped the grapes to survive the journey, and their great color, which allowed basement vintners to “stretch” their production greatly! 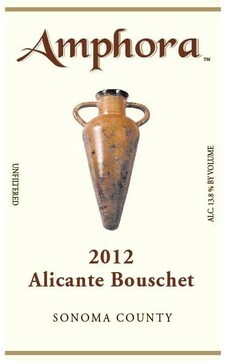 Very little acreage of Alicante remains locally, so savor this rarity, and raise a toast to our winemaking predecessors.